Gabrielle has been a SCUBA diver her entire adult life. She has a passion for diving and loves to teach people, how to overcome any challenges to enjoy the world from a different perspective- one that few ever get a chance to experience. Gabrielle is a SCUBA instructor trainer in Tallahassee, Florida but SCUBA dives and teaches all over the world! When trained properly, SCUBA diving is an extremely safe, rewarding, and fun sport. You will forget all your stresses when you are breathing underwater, soaking in the amazing sights around you! Best of all, this is run through Life Worth Leading, a 501(c)(3) nonprofit organization. Gabrielle has been an avid SCUBA diver her entire adult life and has instructor certifications with four different agencies! She admits her "SCUBAddiction" and has logged 2,404+ dives in Florida and abroad in places like Galápagos, Ecuador, Indonesia, Fiji, Africa, Maldives Philippines, Belize, Roatan, Honduras, Bahamas, Costa Rica, Dominica, and Mexico. Gabrielle enjoys diving in springs and in salt water. She earned her instructor trainer certifications with SCUBA Educators International - SEI (former YMCA) and with CMAS (Confédération Mondiale des Activités Subaquatiques), and her instructor certifications with HSA (Handicapped SCUBA Association) and with Diver's Alert Network where she teaches CPR, First Aid, O2 Administration, Hazardous Marine Life, and more for SCUBA divers and for the non-diving public. Gabrielle has many other certifications including rescue diver, divemaster, advanced nitrox, scientific diver, cavern, and more. Read Gabrielle's article, "Becoming a Better Leader through SCUBA," published in the July 2015 edition of Currents, a journal for SCUBA professionals. Read about Gabrielle's SCUBA liveaboard experience in the Galápagos Islands, Ecuador, published in the April 2015 edition of Currents. Read Gabrielle's article and pictures about SCUBA Diving in Fabulous Florida, from July 2013. Read about Gabrielle's SCUBA diving liveaboard experience in the Maldives (Indian Ocean) with Worldwide Dive and Sail, published in the April 2013 edition of Currents. Gabrielle's passion for SCUBA is shared with her passion for education. She has a Ph.D. in education and her specialty is motivation, so she loves to help people overcome any fear to conquer challenges. She enjoys providing full scholarships to people with disabilities and donating services and equipment to other nonprofit organizations that serve veterans and people with disabilities. She likes to make the learning process fun, too! 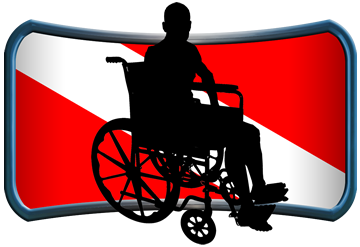 Visit Gabrielle's Handicapped SCUBA Association page for more details about the possibilities including classes. Some people become SCUBA instructors just a few years after learning to dive. Some take even less time. Gabrielle wanted to be as experienced as possible before achieving this status. She logged over 1,000 dives before becoming a SCUBA instructor, and her experience extends from the Philippines to Galápagos to South Africa to the Maldives and more!